This time, Mr. Chaerul A. Taman talks about his memories as a baisho ryugakusei (Indonesian international student in the framework of postwar compensation program) at Hiroshima University. 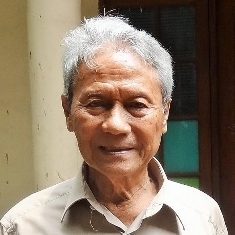 When Mr. Taman was a student at the famous Institut Teknologi Bandung (ITB), he heard about the baisho ryugakusei program and went to Japan in 1962. This program for Indonesian students was part of Japan’s postwar reparations and the participants, who were dispatched to universities in Japan, were called “baisho ryugakusei”. At that time, when very few foreigners were studying in Japan, about 400 international students from Indonesia were enrolled in Japanese universities. 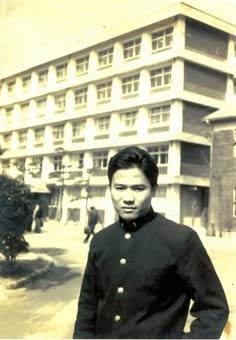 How was Mr. Taman’s student life at Hiroshima in those days ? － First of all, shortly tell me about your background before you came to Japan. I was born in 1940. In 1959, I graduated from high school. Then I was 19. It was just the time of the Indonesian War of Independence* from the Netherlands and for about one year I couldn’t go to school. (*) After World War II, an independence war occurred between the Dutch Empire and the Republic of Indonesia, which declared the independence of the former Dutch East Indies (1945 - 1949). － Where are you from ? I am from Bojonegoro in East Java. I also went to the elementary school there. It is close to Surabaya. My father was a judge, and we often relocated. There were 9 siblings in the family, I was the fifth. In kindergarten, I learned Japanese*. The kindergarten had an interesting name. It was called “Asahi” Kindergarten. There were three other kindergartens in Bojonegoro: “Minami”, “Sakura” and “Fuji”. (*) During the Pacific War, Japan invaded the Dutch East Indies (present Indonesia) and placed it under military administration from 1942 to 1945. － Where did you go to senior high school ? I went to a high school on a small island close to Singapore, in Tanjung Pinang-City *. (*) Tanjung Pinang is the largest city of the Indonesian province of Riau Islands. It has ferry and speedboat connections to Singapore and Johor Bahru, Malaysia. － Where did you go to university ? I entered the Institut Teknologi Bandung (ITB)*. At the beginning, I studied electronics. Then, when I was going to be a third grade student, I changed to civil engineering. That was just the time when I first heard about the baisho ryugakusei program. (*) The Institut Teknologi Bandung (ITB) is a top-class technological university in Indonesia. It traces its origin to de Technische Hoogeschool te Bandoeng (THB) which was established in 1920 by the Dutch colonial administration. During the Japanese occupation, the institute was renamed in Japanese Kogyo Daigaku ('Industrial University'). When Indonesia declared its independence the university became Sekolah Tinggi Teknik (STT) in 1945. In 1959, it became the present Institut Teknologi Bandung. － The baisho ryugakusei program, what was it about ? An important person of the Indonesian Ministry of Education came to the Institut Teknologi Bandung to introduce the program. The person said that Japan was looking for 400 Indonesian students to dispatch to Japan in the framework of postwar compensation program *. (*) Based on the Agreement on Compensation between Japan and Indonesia, international students (baisho ryugakusei) and trainees were sent to Japanese universities. 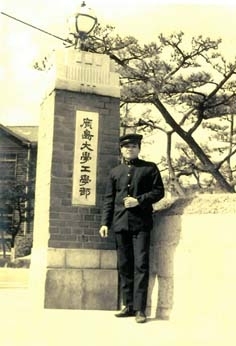 From 1960 to 1965, a total of 385 students were dispatched to Japan. However, the fifth and sixth dispatches were small groups. － Did you take an exam for studying abroad ? We had a written exam and an interview. The dispatch of the baisho ryugakusei was divided into four terms. The first term was in 1960. I took the examination for the second term, but failed. Then, I passed the exams for the third term. － After you had passed, did you get some training in Indonesia ? I attended an instruction course for one month at a training facility of the Ministry of Education at the Puncak Pass close to Bogor. 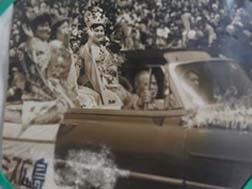 End of March 1962, 100 students went to Japan. They were split up into groups of 50 each. I was in group 2. We left Jakarta by airplane, stayed at Singapore for one night and arrived at Haneda the next day. After that, another 15 students joined us, and finally, we were 115. － What was your first impression when you arrived at Haneda ? I was surprised to see how cold it was. It was March, you know. And I didn’t know anything about life in Japan. － Where did you stay first ? At a house in Kobinata Suido-cho. It was a dormitory specified by the Ministry of Education. We were there for about half a year. Then, I think it was in September, we moved to Hatagaya, where a new dormitory was built*. (*) Kobinata Suido-cho was a place in present Bunkyo Ward, Tokyo. At the beginning, the Indonesian baisho ryugakusei lived separated. In 1962, the Indonesian Students Dormitory (Wisma Indonesia) was built as part of reparation and all of the students studying in the Tokyo area started living there. Hatagaya is in the north of Shibuya Ward, Tokyo. － What did you study in Tokyo ? In Tokyo, I studied Japanese for a year. That was at the Japanese language school of Kokusai Gakuyukai (International Students Institute)*. During this language course, there were exams for entering university. The faculty was determined before we came to Japan. In my case it was marine engineering. Originally I wanted to study civil engineering, but there was no faculty like that, so I applied for marine engineering. (*) The baisho ryugakusei attended a Japanese language preparatory course for one year at Kokusai Gakuyukai. Then they went on to a Japanese university after a predefined selection process. － How was the selection process for university ? Each faculty was separated into the 4 groups of A, B, C and D, according to their Japanese language ability. A group was the best with test results of 80 points and more, followed by B and C. D-students couldn’t enter university. The Ministry of Education selected the universities based on this grouping. For example, A-group students could enter excellent universities like The University of Tokyo. Out of 115, only 3 students managed to go to The University of Tokyo. I was in B group. The marine engineering students were sent to Osaka University, Kyushu University or Hiroshima University. － What happened with the D-group students ? Those who couldn’t enter university didn’t become international students, but trainees. 25 of 115 became trainees. The others entered different universities in various places from Kagoshima to Hokkaido. But many of them went to Tokyo or Osaka. － How was your life in Tokyo ? I was studying Japanese from morning till night. There was a dining-room in the dormitory. And our rooms also were there. We lived in groups of two or three in one room. Big rooms were even shared by four students. In December, it was very cold. We saw Japanese people wearing kimonos at the coming-of-age ceremony and learned a lot about Japanese daily life. － How was food in Japan ? There was no problem except pig meat, which I needed to avoid. And I always carried some spice with me, because Japanese food was not spicy enough. － Where did you pray ? There was an Islamic mosque. － How was the new dormitory ? Approximately 500 students and trainees from Indonesia were living in the new dormitory. It was a big five story building. President Sukarno* built it with the reparation money. But the building was sold before we went back to Indonesia. (*) Sukarno was the first President of Indonesia. After World War II, he declared the independence of Indonesia together with Mohammad Hatta and played an important role in his country's struggle for independence from the Netherlands. － When did you come to Hiroshima ? It was the end of March. The teacher of our Japanese language school had taken me there. At that time, there were no Shinkansen (bullet trains) yet, and we had to travel by sleeper train. It took us 12 hours. This teacher brought students to Hiroshima and Okayama University. － How many students went to Hiroshima University ? (*) From the first to the fourth term, altogether 9 baisho ryugakusei were enrolled at Hiroshima University (including dropouts). － Where did you stay first in Hiroshima ? At a ryokan (Japanese-style hotel) near the station. My seniors didn’t come to pick me up. The following day, I went to the university together with my language school teacher. － What was your first impression of Hiroshima ? At first, the town looked very small to me. Before, I used to live in places like Jakarta, Bandung or Tokyo. － Did you attend the entrance ceremony ? Yes I did. The other students wore black school uniforms. I didn’t know this kind of wear and was dressed in a suit. The next day, I bought a school uniform. I wore that every day when I went to university. － Where did you live in Hiroshima at first ? In the beginning I lived at a lodging house in Asahi-machi, together with two other baisho ryugakusei. The house had two big rooms and we slept just were we wanted. We went out to eat or cooked at home. I was there for half a year. Then I found an apartment on Senda-machi and started to live alone. It was a six-tatami-mat room with a flush toilet. For Indonesian people, a flush toilet is important. At that time the house rent was about 5,000 Yen. To take a bath, I went to the public bathhouse. It was about 30 Yen, I think. － How was the liberal arts education ? The first two years, I was busy with liberal art lectures. The Japanese (language) was very different to that I learned in Tokyo. I was surprised to hear a dialect. － Was there anybody who helped you at Japanese ? No, nobody. But for learning Japanese, you have to study by yourself. Otherwise you can’t master it. As soon as I came to Hiroshima, I bought a TV for learning Japanese. － Did you make Japanese friends ? I played tennis, so I could make some friends. I also did Judo. When I was at ITB, I used to train at a Judo school in town. When I came to Tokyo, I went to a school too, and succeeded in going on to the first-dan level. 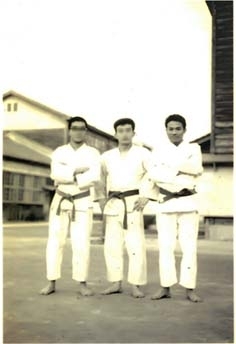 Also at Hiroshima University I did judo for about half a year. Then I started karate and from then on I focused on that. － For how long did you continue karate ? I started with the white belt and trained for six years, from undergraduate to graduate school. When I left Hiroshima I was a second dan black belt holder. When I went home, I started to teach karate to Indonesians. Prof. Kawakami, a specialist in hull strength. I helped him with experiments and research articles. Marine engineering was very important for Indonesia at the time. In the laboratory were 6 students, 4 seniors and 2 peers. Prof. Takaki of the Faculty of Engineering - I think he has retired several years ago - was one of my classmates. At the lab, my seniors cared for me. I had a teacher, seniors and juniors. That’s the usual system for Japan. － After graduation, you entered graduate school, didn’t you? Kawakami sensei recommended me to go to graduate school. So, he made a phone call to the Embassy of Indonesia. But the baisho ryugakusei program was limited to four-year undergraduate course. The Ministry of Education offered scholarships for up to 10 students who went on to graduate school, but I couldn’t receive it, so I made all kinds of efforts and succeeded in entering graduate school as privately-funded international student. － What did you do after finishing master’s course ? I was working as a trainee for half a year at P. Company in Tokyo and after another half a year in Tokyo, I went back to Indonesia. 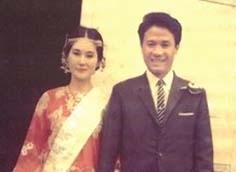 When I finished my master’s course, I married with a Japanese woman in Hiroshima. － Did you meet her in Hiroshima ? Yes. She was the Vice Miss Hiroshima. She went to a university in Osaka and received the teacher’s certificate. Then she returned to Hiroshima. I encountered her on the campus of Hiroshima University. After spending our first year of marriage in Tokyo, we went to Indonesia together. She took a teaching job at a Japanese school in Jakarta. － What did you do after your returned to Indonesia ? I was looking for a job in Jakarta. A senior of mine was operating a ship inspection company, and I was employed there for two years. Then, I became a government vessel inspector, comparable with working for Nippon Kaiji Kyokai (known as “ClassNK”) and did that for two years. I surveyed ships and sent reports to the World Bank. － How do you feel, when you look back on your time as an international student in Japan ? I brought back to Indonesia four presents: Present no.1 is my master’s degree in marine engineering which enabled me to find work. Present no.2 is the Japanese language. I was also teaching Japanese in Indonesia. No.3 is karate. 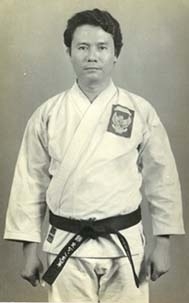 I was a karate instructor in Indonesia. And last not least my wife. With her I could start a family (laugh). Mr. Taman studied marine engineering at Hiroshima University and became a personality abled to contribute to the development of Indonesia. When he was enrolled at Hiroshima University, there were only a few, a dozen or two dozen, international students. There was no study support like today, and I think that it must have been very hard for them to attend the lessons together with Japanese students. At the present, there are 1,157 international students at Hiroshima University and 93 Indonesian students among them (as of November 2014). Hiroshima University has a long tradition of hosting international students from Southeast Asia, especially Indonesia, starting with the acceptance of 24 students from Southeast Asia (Nanpo Tokubetsu Ryugakusei) during World War II*. It is expected that exchange with those regions will become even more active. (*) Invited by the Japanese Government, Nanpo Tokubetsu Ryugakusei were students from the occupied regions in Southeast Asia during the Pacific War. 24 students became enrolled at Hiroshima Higher Normal School or the Hiroshima University of Literature and Science, predecessors of Hiroshima University. They were mostly from present Indonesia, Malaysia, the Philippines, Myanmar and Brunei. In 2013, Hiroshima University presented the honorary doctorate to 3 students from Southeast Asia who were afflicted by the atomic bomb during their studies at Hiroshima University. One of them was Dr. Hasan Rahaya from Indonesia.